Recent changes to New York law will allow home health aides to lawfully provide more services. These expanded roles have the potential to allow more elderly New Yorkers to live at home and on their own terms, with the added assistance of an advanced home health aide. Senior citizens must carefully evaluate the level of care they need to live safely and comfortably at home. They must also ascertain whether Medicare, Medicaid, and other government benefits will cover the services they need. The experienced elder law attorneys at Goldfarb Abrandt Salzman & Kutzin understand the expanded role of advanced home health aides, and how this will affect New York’s senior citizens. 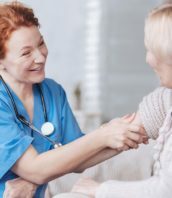 According to the New York State Department of Health, home health aides can now obtain additional training and perform advanced tasks under the supervision of a licensed professional nurse employed by a home care agency, hospice program, or enhanced assisted living residence. The law allows the New York State Departments of Education and Health to begin promulgating regulations for the certification of Advanced Home Health Aides. These new Advanced Home Health Aides may administer routine or pre-filled medications (such as insulin injections or epinephrine). Later regulations will outline further tasks, and are likely to include administering eye drops and topical medications. The expressed goal of the new law is to fill a “gap in care”—specifically, to provide necessary medical services that enable senior citizens to live independently. It also expects to ease the burden on family members who often take these tasks on themselves to allow their elderly loved ones to continue living at home. Medicare and Medicaid have not yet determined how they will reimburse services rendered by this new class of healthcare providers. One of the biggest concerns many senior citizens have with any healthcare service is how to pay for it. Medicare and Medicaid benefits are a necessary financial supplement for almost all of New York’s elderly population. The creation of a new type of home healthcare provider carries potential coverage complications for these services. Medicare and Medicaid subscribers may experience confusion, claim denials, and other problems when they seek coverage for services rendered by Advanced Home Health Aides. The expanded role of existing home health aides may also confuse the issue of whether a senior citizen can, in fact, safely live at home. This is a difficult question faced by many families across the state. No one single test can determine the answer. Every case is different, and every person has different care needs that may or may not prevent living alone. Family members and seniors must carefully assess whether the expanded assistance of an Advanced Home Health Aide can meet all of their needs. This includes financial needs, medical care, hygiene and grooming, eating and food preparation, and any outpatient treatments (such as physical, occupational, or speech therapy). While the services rendered by a home health aide or advanced home health aide can help senior citizens meet these needs, they should not leave seniors in unsafe independent living situations that are beyond their current capabilities. The experienced elder law attorneys at Goldfarb Abrandt Salzman & Kutzin have worked to meet the elder care needs of many New Yorkers. They are familiar with the unique challenges of aging, and the many different options available to help senior citizens and their families meet these needs. With comprehensive planning guided by an experienced attorney, senior citizens can plan for their medical, financial, and living needs, and maintain control over their futures. To plan for healthcare needs, seniors may first require help to determine their current, and likely their future, needs. In some cases, doctors may offer differing opinions about appropriate treatments. Senior citizens must obtain as much information as possible about their conditions and treatments to make informed decisions about their own healthcare. Next, they must make financial arrangements to pay for their necessary services. For many elderly New Yorkers, this depends on eligibility for Medicare and Medicaid coverage. Government programs (such as benefits for veterans or railroad workers) may cover other people. An attorney can help senior citizens find all of the programs for which they are eligible to ensure they do not miss out on any medical benefits to which they are legally entitled. An attorney can also help seniors facilitate financial plans that will help pay for any uncovered expenses. Of course, senior citizens have needs beyond healthcare. Living assistance may involve part-time or full-time assistants working in the home. It can also involve temporary, part-time, or permanent residence in assisted living facilities. Some of the services rendered by these workers and facilities are eligible for reimbursement by Medicare. Some are not. An elder care attorney can help senior citizens access benefits for living and care expenses, and execute financial planning for those expenses that government programs do not cover. Healthcare decisions often make the greatest impact on a senior citizen’s daily life. Seniors can take control of these decisions by planning for their current and future needs with the assistance of an elder law attorney. We help seniors plan their future in order to retain control over it. The attorneys at Goldfarb Abrandt Salzman & Kutzin have decades of experience in protecting the legal rights of seniors. Call (212) 387-8400 today to schedule your consultation.